I’m sharing here how to transfer Bitcoins from coins.ph to Blockchain account. As mentioned from my previous article on “How to Buy Bitcoins in the Philippines” I recommend having a Blockchain account. It is very important in securing our Bitcoins, Bitcoin Cash and Ethereum. Bitcoin trading and investing platforms in the Philippines are not very advanced compared to other countries. Many people ask me if having coins.ph is enough. Coins.ph is a great tool to easily buy and send Bitcoins however, in my honest opinion, it still needs to improve and develop more security features like having private keys, wallet authentication codes and secret phrases. That’s why I recommend having Blockchain account to complement a bigger and more secure BTC wallet. The fact that we have no local cryptocurrency brokers yet in our country would mean we should rely on the world’s leading software platform for digital assets, none other than Blockchain.info. It is very important because it is the best way I know to protect and back up Bitcoin and Ethereum. 7. Enter the amount you wish to send to your Blockchain account. (You can either enter BTC or PHP). In this example, I’m sending 500 pesos of BTC to my Blockchain account, so I chose PHP. 9. 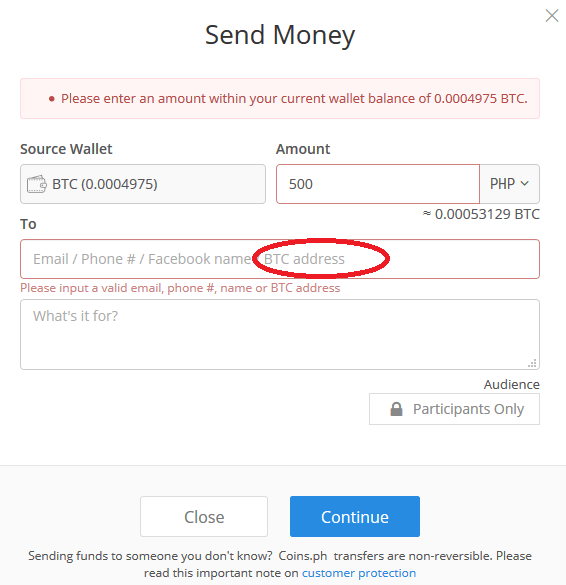 Enter the info you want to note to complete the SEND process in your Coins.ph account. 10. Press the CONTINUE tab and select the BTC fee you want for the speed of transaction you prefer. Voila! You just sent Bitcoin to your Blockchain account. Hello, MIss Fehl. how much is the fees/charges to send Btc from coinph to Blockchain and how much also to send from Blockchain to Hardwallet/Nano S? Thanks a lot. Hi Ms. Fehl, Do you have any idea how to transfer from BTC to Ether in Blockchain? Hi Fehl do you have steps on how to send from blockchain to coinsph? coz i tried it earlier but it wont go through. Hi. Don’t convert your money in coins.ph. I just lost my converted bitcoin like a bubble. Nawala bigla last time I check meron pa tapos ngayon biglang nawala. And the sad thing here is coins.ph didn’t tell me it happened. Anong klase serbisyo yan? Huwag kayo papaloko sa scheme na to. I’m so disappointed. Great article! But I think this is only good when you are HOLDing for the long-term. However, if you’re trading bitcoin, lugi ka sa transfer fees. Especially now that the transfer charges are so high. Correct me if I’m wrong Ms. Fehl. I know this may look like spam, but you can check it out to confirm this. By any chance, are you also a lawyer? By the way, I’m a fan of your site! (Pinoy din ako at nagchecheck ng stock updates hehe) More power to your site, Fehl! Hi, I remember saying that funny quote years ago LOL and I actually published that article years ago, too from a partner website. They transferred that post and it’s now on Letterpile 🙂 I still LMAO when I watch that video I added at the end of the article. I’m not a lawyer, I admire lawyers and I’m a fan of Olivia Pope’s character and Annalise Keating. They rock! Thank you for following. Hope to see you at Dailypik’s Facebook page, too. God bless! I think your account with coins.ph is secured if you activate the 2FA. Any idea about the transfer charges?